Our Emergency Response System provides peace of mind. With a touch of a button, help will be on the way. If you need assistance, whether it be day or night, you can call for help quickly from anywhere in your home. If you need help, push the wrist/necklace transmitter or the large help button on the unit. The system will automatically dial the Monitoring Centre. Our call centre professionals can hear you through the microphone on the unit. If you have an emergency, you can let them know that you need help. If you push the button by mistake, just press the CANCEL button. If the call still goes through to the call centre, don’t worry just tell the operator you are OK. If you don’t respond, help will be sent immediately. The unit speaks to you through a built in speaker phone. Volume controls can be found on the bottom of the unit to control the volume of the two way speaker system and the other for the volume of the speaker. There are easy to use buttons with braille characters. This light weight device is worn around your neck and detects falls by the wearer. The pendant triggers an automatic call for help through the base unit as well as sounding an audible warning. 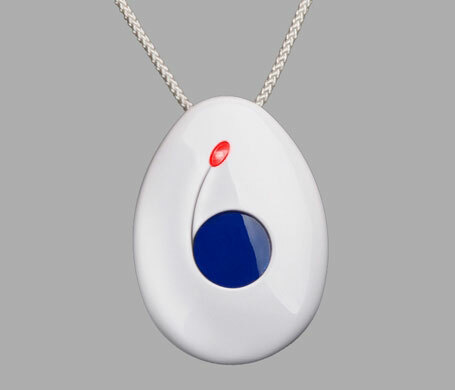 The pendant also has a manual trigger button so the wearer can signal for help at any time. A personal emergency response system is a proactive step in safeguarding loved ones. Contact a Family 1st location near you.